New Power Against C. diff and other Pathogens Now in Economical, Dilutable Concentrate SSS Perisept Sporicidal Disinfectant Cleaner eliminates and prevents the spread of C. difficile, as well as MRSA and 45 other pathogens, including the ESKAPE pathogens - Enterococcus faecalis, Staphylococcus aureus, Klebsiella pneumoniae, Acinetobacter baumannii, Pseudomonas aeruginosa, and Enterobacter species. 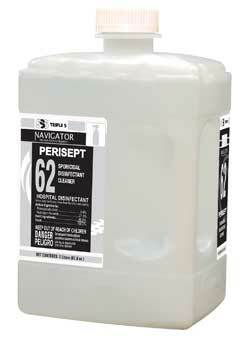 Perisept contains no alcohol or bleach, requires no rinsing and leaves no film on surfaces. Hospital-grade is ideal for surgical rooms, patient rooms, physical therapy departments, nursing services, autopsy facilities, long-term care facilities and nursing homes. According to the Centers for Disease Control and Prevention (CDC), EPA-registered disinfectants with a sporicidal claim have been used with success for environmental surface disinfection in patient care areas. Power That Lasts With its shorter kill times and powerful wetting agents, SSS Perisept stays wet and works faster. The outcome is assured efficacy against hard-to-kill C. difficile spores and other dangerous pathogens every time you clean and disinfect. Perisept provides maximum effectiveness without the risks of bleach, including damage to carpet, clothing, upholstery, LCD screens, medical equipment, and other hard surfaces. In addition, one-step, one application Perisept saves time and labor cost compared to bleach, which requires pre-cleaning and rinsing. Benefits of a dilutable concentrate is powerful and cost effective, so you can enjoy the benefits of the industry’s most advanced disinfectant cleaner every day, facility wide. For use with the Navigator Dilution Control System – available in portable, single wall mount and 4-station wall-mounted dispensing system. All dispensers are precision engineered to deliver the exact 32:1 water/concentrate ratio needed for optimum cleaning and disinfecting performance.